Here are our Top 11 tips while you are on the Everest base camp trail. 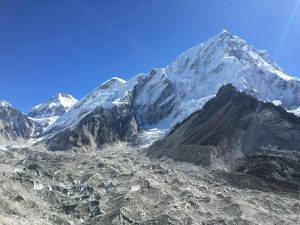 Over the past ten years, I have climbed Everest to the summit and lead 30+ Everest Base Camp treks, and over those years I have noticed quite a few changes that are becoming concerning on the trail. 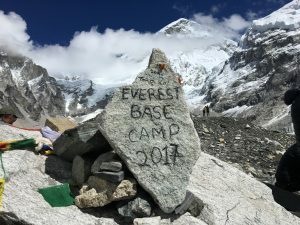 Even though the Everest Base Camp trail is a trekking route, many risks are presented that people need to be aware of and prepare for, so here are my Top 11 Tips while you are on the Everest base camp trail: CLICK HERE and check out my Top 10 Tips in preparation for your Everest base camp adventure. 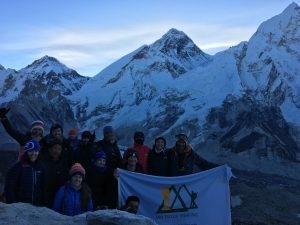 Before you read our Top 11 Tips you really need to consider having 3 nights acclimatization in Namche Bazaar. Having an additional nights acclimatization will give you the best chance at being successful, safer and having a more enjoyable experience in the Everest region. Why risk getting serious altitude sickness. 1). Pacing, heart rates and attention to breathing are all super important. If you are trekking to Everest Base Camp on an Ian Taylor Trekking trip you will have 3 nights in Namche Bazaar on the way up the trail, which will give you a safer and more enjoyable experience going to altitude. All we ask is you come in excellent physical shape. You need to maintain a slow pace that our guides set. You need to focus on deep breaths in through your nose and out through your mouth. Your goal should be to keep your heart rate as low as possible at all times. 2). Keep a close eye on your surroundings. 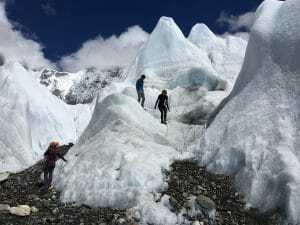 There is objective danger on many parts of the trek, including other people, porters, yaks, donkeys, rock fall and landslides. You need to make sure you are aware of your surroundings at all times and watch each step you take in risky areas. Your personal safety has to be your main concern at all times on the trail. Always stay on the mountain side of the trail and away from any drop offs. 3). Always stay on the mountain side of the trail. With high drops offs and risky uneven trails you need to be aware of your foot placement and stay away from the edge of the trail. 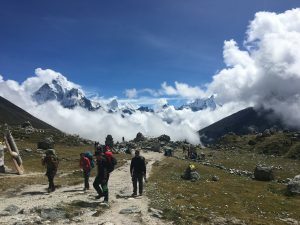 There are no railings, and with large numbers of trekkers, animals and porters carrying heavy loads, you need to stay on the mountain side of the trail. Stay well away from drop offs at all times. There are some serious and dangerous landslide areas on the trail and you need to move through these areas as quickly as possible and our staff will make sure you are aware of them and manage you through them. 4). Make sure you walk in single file in risky areas. Always walk single file as yaks and animals sometimes come out of nowhere and you need to be able to stay well out of their way. Using a trekking pole can help steer yaks out of you and your team mates way. Just plant the pole out in front of you. Do not wave your trekking pole at any animal or hit them with your trekking poles. 5). Make sure you treat all cold water. When you get cold water in your bottle on the trail, you MUST treat the water with water purification tablets before you drink it. Drinking dirty water will ruin your trip. You can buy bottled water, however we advise against this as there is currently no way to recycle the plastic bottles in the region, and it causes a lot of unnecessary rubbish in the area. If you find the water is murky do not drink it and look to bottled water instead. There are challenges with the water in Gorak Shep so be prepared to buy some bottled water. Once you have come prepared and trained, this should not be a concern. On the trail, you will be walking for thirteen days straight, with 30% to 50% less oxygen than your body would be used to having at sea level, which puts your muscles, heart and body under a lot of pressure. You do not want to be moving fast up the trail each day. Our pace will be slow and steady, with plenty of breaks especially on the longer hills, which can last for 2 hours. You need to regulate your heart rate as you slowly move higher each day. Correctly breath, in through your nose and out through your mouth. This technique will be very important. 7). It is vital to be drinking 4/5 liters of water each day. When you are training at sea level, you should be drinking a liter of water per hour of exercise so when on the trail, you need to be drinking at least 4/5 liters each day. THERE IS ABSOLUTELY NO EXCEPTIONS TO THIS RULE. The International Society for mountain medicine defines high altitude as between 1,524m/ 5,000 feet and 3,500m/ 11,500 feet, very high altitude as between 3,500m/ 11,500 feet and 5,486m/ 18,000 feet, and extreme altitude as any height above that. The higher you go, the greater the effects are on your body and the more important it is to stay hydrated. 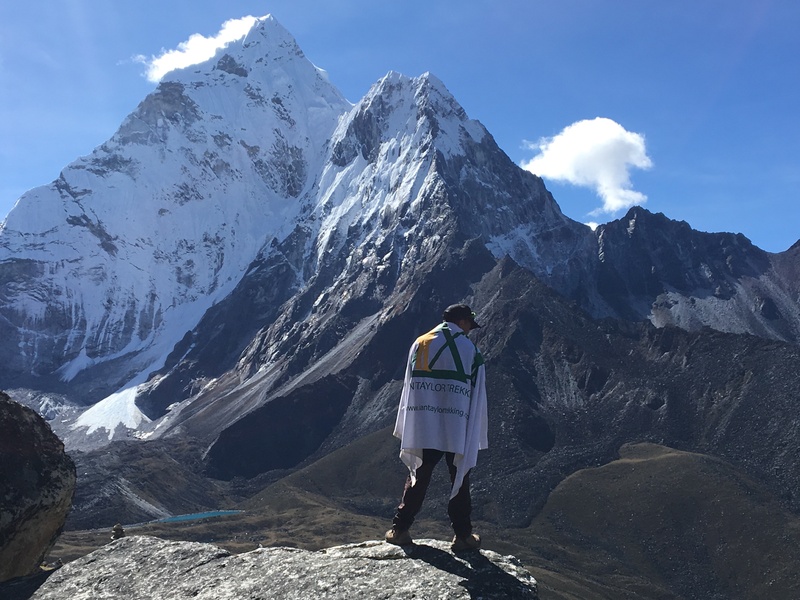 We dehydrate much faster at high altitude, and when you fail to stay hydrated, you run the risk of altitude sickness and ultimately ruining your trek. You may not realize how much water you are losing through exertion, but the lower oxygen levels make you breathe in and out faster and more deeply, so that you lose more water through respiration. According to the wilderness medical society, you lose water through respiration at high altitude twice as quickly as you do at sea level. 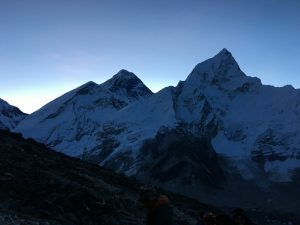 High altitude can also make you need to urinate more often and can blunt your thirst response, putting you at even greater risk of dehydration. 8). Do not ignore the signs of Acute Mountain Sickness. 9). You are trekking as a team, not individuals. You need to look out for yourself and other people around you on your trek. Team work is essential for safe group travel, look out for each other and you will enjoy the journey a lot more. If people cannot keep our minimum pace they should be turned around before they become a risk to themselves and the team. Please let the guides know if a team member is feeling unwell. 10). Have the right clothing, gear and equipment. 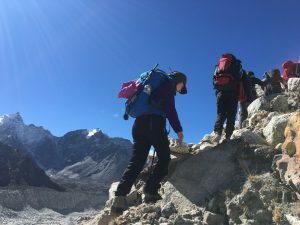 I see too many people on the trail with cotton clothing, poor quality hiking or trekking boots, small insufficient day packs and the wrong clothing with minimal water. Mt. Everest and the Everest base camp trek demands respect. 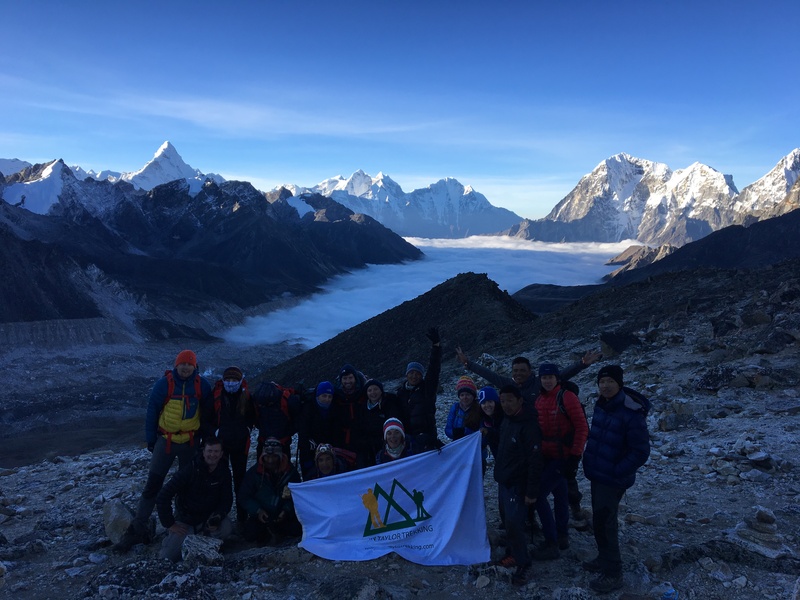 The conditions can be harsh even in the main trekking seasons of March, April, May, September, October and November. You need to make sure you have a proper light weight day pack that is at least 30 liters, that can hold 3 liters of water, water proof rain gear, down jacket, poles, sun cream, personal medication, liner gloves, your personal first aid kit and other personal kit you may need. On any given day it could be hot, cold, rainy, hailing, snowing or windy so make sure you have the right gear each day as you walk up the trail to Everest. 11). Manage your personal hygiene well. There are more and more shower facilities, western toilets, sinks and mirrors than ever before on the trail. There is also better and well prepared food in most of the lodges. 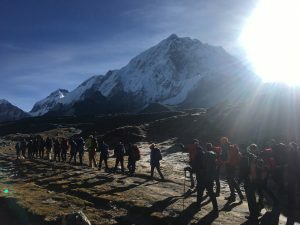 On our treks, we use the better quality lodges but there are still dirty lodges with unclean practices out there, and you need to stay away from them. You will need to use hand sanitizer, cut your nails, clean your body and make sure you are limiting the risk of getting sick from dirty hands or touching unclean surfaces. Be aware you are in a remote wilderness location with limited resources and services, so please keep clean for a more enjoyable journey up the trail to Mt. Everest base camp.